Acharya Vinoba Bhave (September 11, 1895 - November 15, 1982) was a freedom fighter and a spiritual teacher. He is best known as founder of the Bhoodan (Gift of Land) Movement. 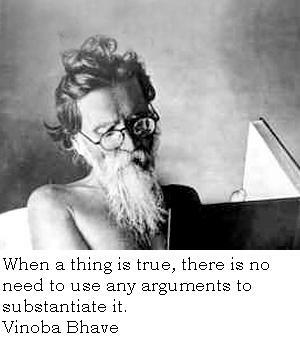 Here I have compiled down some of the famous Acharya Vinoba Bhave quotes and sayings. Just hope you will like the quote compilation and learn something new from Acharya Vinoba Bhave words.